Our ever-demanding market has forced developers to pack every segment to the hilt. Earlier, there would be a luxury segment, followed by a premium segment, and then an affordable segment. Not anymore. Now, there’s a compact luxury segment, then a compact premium segment, and a super compact affordable segment. As our demands continue to grow, as do our choices. On the looks front, the frontage looks stunning, the biggest highlight of the Hillcrest is the fact that the project is located on a hill where the first habitable floor is 4 levels above the ground. Top it up with a 30,000 sqft. Podium, Landscaped Gardens, Swimming Pool, Gymnasium designed by Mark Mahan of Singapore and it seems like a winner. But hold on!! The developer has been attempting to launch this project since 2010, however, was facing multiple issues with regards to approvals since part of the land belongs to the government for whom the developer was supposed to construct low-cost housing and hand it over to MHADA. The process took time and the project got delayed. 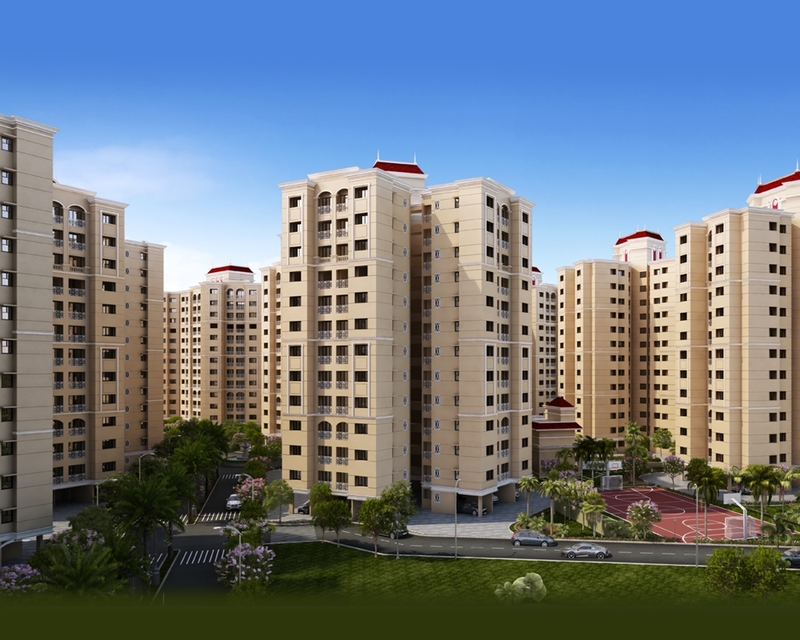 In fact if you have a look at the master plan it has 1 Room kitchen and other 2 BHK apartments for sale on the same floor. In terms of connectivity and social infrastructure the location as such is extremely good: R City mall round the corner makes the shopping and entertainment a convenient. A 5 minute drive takes you to Hiranandani Powai where you have the best of schools, hospitals and restaurants. Godrej which is spread across 500 acres has decided to lease out land is now transforming into an IT and Pharma hub. VIkhroli as a destination now has it all. The location is self-sufficient however you will need a car for easy commute. A couple of negatives, there are slums around the project which area a major deterrent also currently the approach road is a virtual auto and taxi parking lot which can be a nuisance. The developer has tried his best to fit in maximum amenities in the project and full marks to him for the same given the constraints & size of the plot. 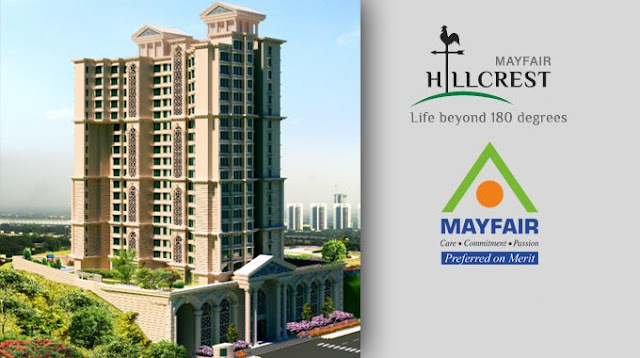 Maximum amenities are slotted on the podium and the zone has been kept vehicle free. Not ideal but manageable. 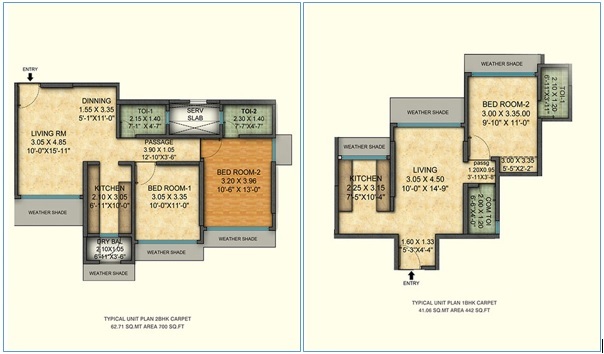 Coming to the floor plans: Let me sum it up in one line, they are super compact. A 2 BHK set up in a carpet of 675 sq. ft. is not ideal. Bathrooms of size 6 ft. x 4 ft. and living room of size 15 ft. x 10 ft. is certainly not adequate for a young family. In case of the 1 BHK the bedroom is of approx. 100 sqft. and you feel pressed for space. The living space leaves a lot to be desired. Well to its credit it’s an excellent location and a beautiful view of the Vashi creek and Godrej Greens. This is one of the rare projects that I have come across where rates are being quoted based on carpet area. This is one of the rare projects that I have come across where construction schedule and delivery timelines are mentioned in newspapers and websites. This is one of the rare projects that I have come across where the approved documents are made available online. But all said and done its more of an investor product, less of an end use product.